Sean Magee is running away from his mistakes, from bad times, and from the ones who love him. Sean always tried to please others, so when he believes he lets them down, he runs. After his mother, a devout Catholic passed, Sean enters the seminary in Italy, believing she would be pleased. While at the seminary, he realizes he's not cut out to be a priest after he falls in love with a young art student named Chiara Montanari. The two become inseparable, yet wine becomes Sean's priority, turning him into an alcoholic. He considers Chiara deserves better, so he runs away from the seminary and her without offering a reason or a goodbye. He later returns to New York, and when his sister, Cathleen gives birth to her son, Colm, he becomes a surrogate father because the child's biological father left before his birth. At age 7, Colm, suffers from a heart defect, yet wants to meet his biological father. So Sean and his good friend Dr. Gaspar Bascu along with Catherine travel from their New York home to California to meet the man; however, he does not show. Then when Colm dies, Sean runs away yet again, blaming himself for the child's death. Sean settles in California to become a firefighter. He decides he is better off being miles away from his sister and Gaspar, who have since married. Sean needs to fight his demons and alcoholism alone, and by becoming a firefighter, he perceives he can save others. Then he gets trapped in the attic of an old house engulfed in flames. In the smoke-filled room, he cannot see anything and prays to a God he no longer believes in. He pleads to be spared promising to be a better person, but mainly to be able to return to Italy and right the wrong he did to Chiara. Just as he believes he will perish, a bright light appears, and an angelic apparition clears the smoke showing him the way to escape. With no other option except death, Sean jumps three stories to spare his life. Where this type of fall would result in death, Sean lives, though suffers serious injuries to his legs and back as well as sustaining swelling in his brain along with horrendous burns. Gaspar flies to California to persuade him to return home to New York and be with his family, but Sean refuses, so Gaspar hires Tom, a registered nurse and physical therapist to work with him to get him back on his feet. His best friend and firefighter, James, visits Sean in the hospital every day, and when Sean recovers enough to be somewhat ambulatory, he produces a young woman named Libby and a yellow Labrador retriever named Chief, to be Sean's service dog. It is love at first sight for both canine and man. Now as Sean heals, he learns something about himself and reaches out to his friends to heal them as well. He knows he can no longer run away when things get tough and needs to teach this to others too. This passage in the book demonstrates this: "As days turn into weeks and then months . . . Sean had come to recognize something in each of them [his friends], something he, too, was experiencing, a feeling he'd had in some form or another his entire life. Each of them was always wanting. Something more. Though none of his friends had been addicted to alcohol, they each had, in their way, their own broken spine, their weak link. They each had a certain crack that, like his, needed to be reinforced. . . . Everyone, Sean knew, had a demon or was once a demon, and if not either, could easily become one given the right conditions. Then again, he thought, demons were nothing more than fallen angels like himself and his new friends." Through the celestial intervention of his angel, Sean understands everyone has a special purpose, and one no life is worth more than another. This engrossing novel digs deep into the heart offering empathy, comfort and hope—not only to Sean and his friends and family—but to the reader too. 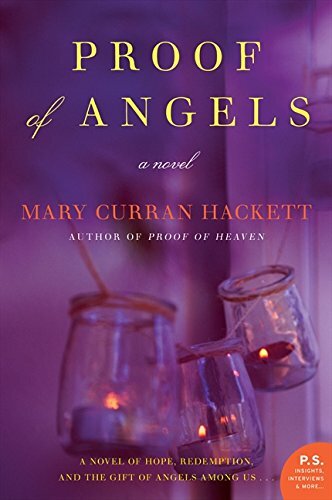 Ms. Curran Hackett offers remarkable insight into the human psyche as Proof of Angels is an intimate search into one's soul to perceive what truly matters in life.